The core set of oppositional ideas that permeates my thinking and writing is the one between the conceptualization of the Self as a distinct and singular entity, and Systems theory, which posits that the self exists only as a function of the systems that create and maintain it. A profound metaphor from the physical world for the Self/System dynamic, is the Gothic cathedrals of the Middle Ages that exemplify this dynamic of tension and its resolution in a concrete and beautiful way. The tall and massive stones remain standing—and have for centuries—supporting the structure, which then allows the beauty of the arches and the delicate light to emerge through the stained glass windows at the top. 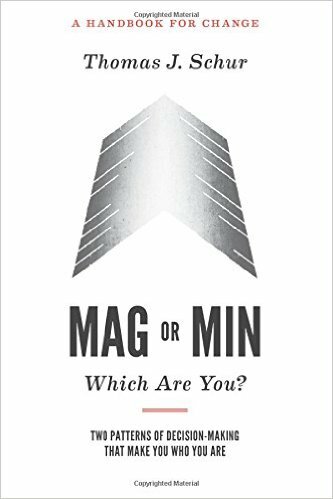 I have begun to write a sequel to Mag or Min: Which Are You? Just like that book, this one will be a handbook. It meets the need for a structure for the ongoing work on self using the Mag/Min framework. It is built on Bowen’s idea about operating on principle as the primary characteristic of Differentiation. I have coined a new term to allow for the ability to scale how much a person’s behavior is grounded in principle, which parallels Bowen’s scale of Differentiation. That new term is Core Rationale which is the basis for a person’s decisions, that is, the assumptions behind them. It is set up as a continuum that ranges from Opinion at one end to Principle at the other, where an Opinion is more determined by the system, and therefore at a lower level of differentiation, and a Principle is more determined by the basic beliefs of the person, which they hold in interactions with others in the system and therefore indicates a higher level of differentiation. This new idea of scaled Core Rationales is entirely congruent with Mag/Min. Generally the rules for Magnifiers will involve allowing for the awareness of possible limitations that need to be accepted, and for Minifiers, allowing for the awareness of possibilities that need to be acted on. This additional conceptualization makes Mag/Min more powerful because it provides the structure of a personalized guide, a set of rules that works for that person and becomes reliable, because it comes out of their own experience. ﻿﻿﻿﻿﻿﻿﻿﻿One of the concrete manifestations of ideas that have emerged over the years is my book Mag or Min: Which Are You? While it is now available on Amazon, you can still read a synopsis on the Book page in this site. You will also find a FAQ page there which helps clarify misunderstandings about the basic concepts. Having a grasp of the major ideas in the book provides a way to make more sense of the essays on the site overall. There are two podcasts of interviews I have done with ﻿ John A. Warnick, the founder of the Purposeful Planning Institute. (purposefulplanninginstitute.com). The first is on Mag/Min, which provides an engaging and thorough summary of the basic framework and content of the book. The second is on Leadership and Bowen theory which incorporates my Mag/Min framework. You can read a summary of Mag/Min in the Primer on the Book page above. You can read my essay on Leadership and Bowen theory on the Essays page above under the Leadership link.